Posted February 22nd, 2019 by Mobile Music School & filed under Benefits of Music Education. 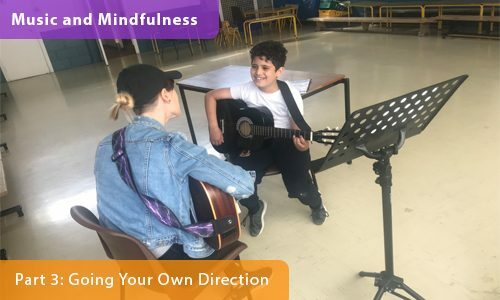 As we come to the end of our Music and Mindfulness series, we take a look at some of our talented students and the direction they have taken with their music lessons. Last week we discussed the importance of a child-centred approach to music education. This week we see the results of our unique teaching style as our tutors use students’ personal interests to direct their music programme. Here we see one of our talented students Emily performing Pumped Up Kicks by Foster The People. With the help of our music tutors, our students are able to explore the music they enjoy and that relaxes them after a long day at school. This is one of Emily’s favourites! To finish up our Music and Mindfulness series, we talk to Zoe about how MMS students have the opportunity to explore all sides to music with their guitar lessons. To ensure all music lessons are fun-filled and enjoyable for children, we encourage students to take their own direction, whether it’s classical, rock, pop, jazz or even song writing! We think it’s important to really get to know students and their musical interests from the get go. Our music lessons act a support and guidance to help them be the type of musician they want to be. This non-pressurized environment relaxes students and encourages them to develop a hobby that can be used as a mindfulness technique. To find out more about what’s involved in our after-school programmes, please visit the after-school page of our website. To learn more about how our after-school music lessons and how they can benefit your students, please get in touch with us to discuss these options in further detail. Music and Mindfulness – Part 4: Round-up coming next week!